Are you looking for a trampoline that won’t break the bank, but still be safe to use? 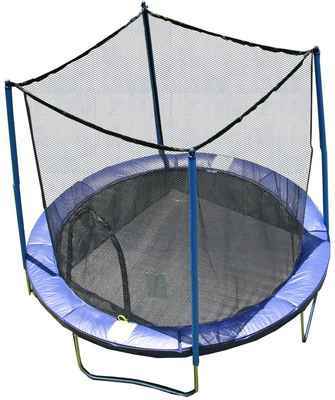 Well then the AirZone Outdoor Spring Trampoline may just be the perfect one for you. The AirZone Outdoor Spring Trampoline has a sturdy steel frame. The eight foot model comes with four W shaped legs. This is good because it allows for eight points of contact on the ground to increases stability. Even though it is a smaller trampoline the weight limit does not suffer. It can still hold up to 200 pounds, so this helps back up the fact that it is good build quality. The jumping mat is woven black cloth, and be sure to remember that the jumping area is not the full eight feet. It is closer to seven feet because of the space for the springs between the jumping mat and the frame. Speaking of springs the AirZone Trampoline has 56 plated steel springs, which offer superior bounce. It also includes a padded spring cover to cover the springs to ensure extra safety for preventing fingers from getting pinched. Lastly the trampoline provides a safety enclosure that hooks on to four padded poles which extend from the legs. The net hangs down and tucks under the spring cover. This enclosure is a durable net that will keep jumpers from falling off. The fifteen foot model of the AirZone Outdoor Spring Trampoline is similar in that the jumping mat is the same quality, just bigger. Also, the spring cover is the same as the smaller model. The enclosure to the bigger model still hooks on the same way, but with the bigger model there is six padded poles, instead of four. This is because the bigger model has six W shaped legs which provides twelve points of contact. The other difference between the larger and smaller model is that the larger model has 70 steel springs. This ensures the same great bounce and the larger model can still hold 200 pounds at a time. The biggest advantage for the AirZone Outdoor Spring Trampoline is the cost, also it is great that you can get a small eight foot model. Some complaints though is sometimes not all the parts are in the box. They will get the missing parts to you, but this can delay set up. Once you get all the parts however the trampoline is easy to set up.